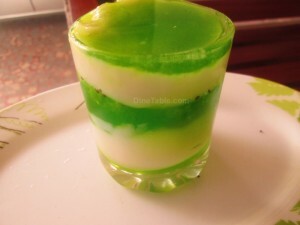 Vanilla Panna Cotta with kiwi topping is a delicious Italian dessert. It is very easy to make at home and requires less ingredients. This is a classic dessert can be served to your guests, friends and loved ones. Kiwi fruit is highly packed with vital nutrients vitamin E, copper, vitamin K, magnesium and phosphorus. It helps to reduce the risk of cancer, heart diseases and other conditions. It is good for the skin, better sleep, lowering blood pressure, constipation prevention etc. Try this healthy dessert & enjoy this valentines day with your loved ones! Soak gelatin in water for 5 minutes to soften. Pour the milk, cream and sugar in a pan. Stir well. Heat the pan in a low flame then stir continuously and remove from the flame when you see small bubbles on the edges of the pan. Squeeze softened gelatin with your hands to remove excess water and add to the milk mixture. Stir well to dissolve gelatin completely. Let it cool slightly. Vanilla Panna cotta is ready. Now to assemble, pour a small amount of vanilla panna cotta into the glass and fill the remaining half of the glass with kiwi crush, then vanilla panna cotta and on the top with kiwi crush. Then place in the refrigerator for 30 minutes. Tasty Vanilla Panna cotta with kiwi topping is ready.